One of the premier transport services in the U.S and Canada is Nationwide Transport Services. "We treat every car as if it were our own," owner Jason Foltz told us. 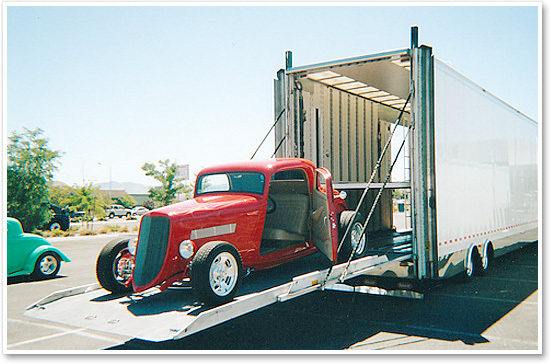 With twenty years of experience and a reputation for using the latest technologies in transportation advancements, Nationwide Transport is a proven industry leader and a name you can trust when you want your collector car delivered to your door. Owner Jason Foltz started out running a small transport company and has built his business into a service that dispatches shipping orders all over the country. They can even service your need for an international transport service. "We can provide transportation ... coast to coast, north to south...we have east coast routes, west coast routes, and we also ship vehicles to Alaska and Hawaii," Foltz told us. Nationwide uses only licensed and bonded carriers who are required to maintain insurance, authority, and other pertinent information which is kept on file with Nationwide at all times. They have a variety of ways to serve you, and will ship via flatbeds, vans, and provide all other equipment as needed. Click the arrow to watch a short video of one of Nationwide's carriers unloading a Chevelle SS. NTS believes they have built the most reliable network of carriers to meet all of your transport needs. With over 2,000 carriers in their network, Nationwide Transport Services can provide special attention to collector cars. Nationwide's carriers are well known for their dependability and quality of service. Because they have so many carriers bidding on loads they can offer competitive rates. The special services they provide include backup transports, monitoring of load schedules and tracking of all vehicles at all times; and this is all included in your quoted cost. Foltz said that if a customer wants to pay for their premium service, a car can be picked up in as little as five days. For a free car transport quote, you can call (772) 494-0086; or Click here to go to their free quote page. NTS shows how much they care by offering a live help service where you can talk to them via the internet or send them a message to be answered by a live attendant. You'll see this graphic at the top of the home page. When you Click this link you will be connected to a live person who will answer your questions. A dialog box will come up and you can type in your live chat questions. Nothing is more frustrating than talking to transport dispatchers that don't know what they are doing. Nationwide has a reliable sales staff with experience in delivering classic and specialty vehicles right to your door. "We are able to transport your car in a safe and timely manner, door to door to any destination in the USA," Foltz said. "We are accredited by the better business bureau and we guarantee our service. We treat every car as if it was our own. At NationWide Transport you can expect a higher level of quality and service for your cross country auto transport." Do your research and pick the company that fits your needs. We think Nationwide Transport Services will fill the bill for a lot of collectors.